The trouble is that many of the things that optimize high occupancy Wi-Fi run contrary to industry best practices. Therefore, I'll take a systematic approach, and offer an explanation to go with every recommendation. Recommendation: Configure channel width for 20 MHz, only. Explanation: There are many reasons for using 20 MHz wide channels in high occupancy areas, but the one that most appeals to me is the fact that signal-to-noise ratio (SNR) must be higher when channels are wider. 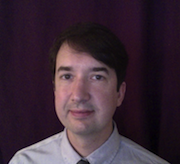 Wi-Fi data communication will succeed or fail based on SNR (with rare exceptions). In high occupancy areas, low SNR areas will naturally occur due to signal loss through human bodies & other objects, and/or due to interference (noise) from neighboring wireless devices that naturally are present when large numbers of people are present. Using the narrowest Wi-Fi channel possible -- which is 20 MHz in 802.11n/ac networks -- creates an environment where data communication has a chance to work at the lowest levels of SNR. Recommendation: Manually configure a uniform, static transmit power for all AP radios. Explanation: In high occupancy areas, we want stability. Users ultimately don't care if throughput tests look good; they care that Wi-Fi is accessible and stable. AP transmit power changes cause instability for several reasons. AP transmit power can be set too high, which can cause Dead Zones. ("Dead Zones" meaning, areas where client devices can connect, but don't get consistent data access. Dead Zones happen when client stations are unable to transmit at a power level high enough to match the AP). AP transmit power can be set too low, which can cause Crowd Failures. ("Crowd Failures" meaning, situations where the Wi-Fi works until a large crowd of people arrive. Crowd failures happen when client stations transmit at power levels that are higher than AP transmit power levels, because higher powered client transmissions create unanticipated instances of co-channel interference [CCI].) And whenever AP transmit power changes, client stations may have to adjust to that change, and those adjustments often cause devices to transmit using inappropriate data rates, thus causing collisions & retransmissions ("Retries"). For those three reasons, we need static transmit power. The idea of using uniform transmit power is a tad more controversial than the idea of using static transmit power. I endorse uniform transmit power because it facilitates mobility. If AP transmit power varies, then stations will have to make the aforementioned data rate adjustments when roaming between APs. 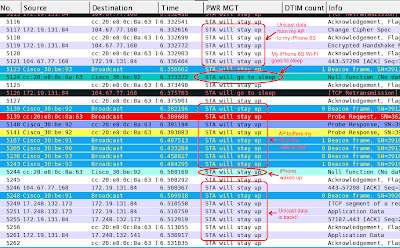 If AP transmit power is stable, then it is more likely that client devices will choose the "correct" data rate (meaning, a data rate that does NOT cause collisions & retries) immediately after connecting to its "new" AP. Recommendation: Configure AP transmit power to a "medium" level. 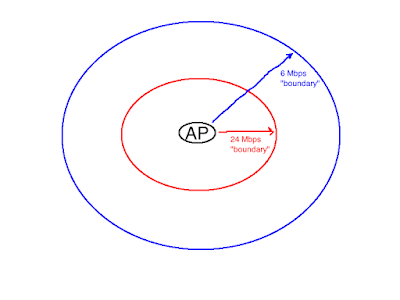 Explanation: The problems with having AP transmit power set too high or too low are explained in the second paragraph of the previous recommendation. By "medium" AP transmit power level, I mean somewhere between 14 and 17 dBm. Recommendation: Set the minimum basic rate (MBR) to 6 Mbps. Explanation: I hate to be the type of Wi-Fi guy that writes a blog post and in that blog post asks another Wi-Fi guy to read another blog post, but I have to be that type of Wi-Fi guy. (And if you know which movie's dialogue I'm paraphrasing there, major kudos to you!) Ghost Frames are explained in my Ghost Frame Killah blog post from six months ago, and this recommendation is all about mitigating the problems that occur in high occupancy areas due to Ghost Frames. I should point out that Ghost Frames are mostly a DESIGN problem. So, if the MBR was set to 6 Mbps during the design & validation of the Wi-Fi network (thus, allowing Ghost Frame areas to be mapped out), then the MBR can be set higher once the Wi-Fi is fully deployed. The problem is that most high occupancy Wi-Fi is NOT designed & validated with the MBR set to 6 Mbps, so Ghost Frames end up making most high occupancy Wi-Fi unstable. A big note about this recommendation is that it really, really, should be paired with the next recommendation. Recommendation: Disable enough AP radios so that REAL WORLD Wi-Fi devices show no more than one AP per channel covering all areas. It helps to have floorplans and installed AP locations when executing this recommendation. You want to be able to visualize where Wi-Fi coverage on each channel is present, so that you don't have to do endless walking, testing, and re-configuring. 1) These are optimizations for STABILITY. You will see WORSE "test" results with these recommendations. Throughput will be lower, retries will be higher, etc. If your goal is to have great test results and watch the Wi-Fi fail for real world users, then DO NOT use these recommendations. 2) I would not expect these recommendations alone to make high occupancy Wi-Fi perfect. Adjusting AP locations, blacklisting channels that show interference, and using external antennas can all improve Wi-Fi in high occupancy areas, DEPENDING ON THE DEPLOYMENT. These are general recommendations that will help ANY high occupancy deployment. If you want your specific high occupancy Wi-Fi deployment made closer to perfect, email me. I'm already committed to fixing a large site, high-occupancy Wi-Fi deployment until mid-March, 2018, but once that's finished I'll be available.